Provided by Captain James Schlegel of Sea Dog Sportfishing Charters of Sheboygan, with contributing reports from other area anglers. The waters offshore of Sheboygan Wisconsin have produced some exceptionally large trout and salmon over the years. The following is a list of the largest documented fish caught out of the port of Sheboygan starting in the calendar year 2001. Any angler is welcome to enter their fish on the "Sheboygan's Big Fish Board". You do not need to be a club member to register your catch. All fish must be caught in Sheboygan waters and the weight documented at either the Wharf or a recognized area fishing tournament. 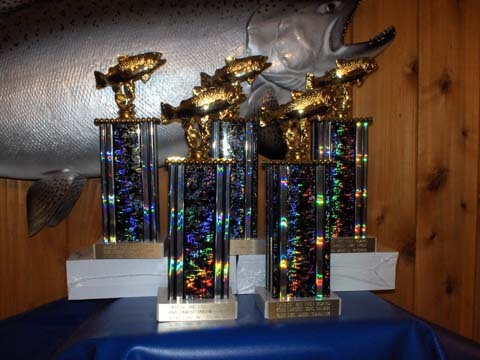 A trophy will be awarded to all anglers at the end of the year and presented by the Sheboygan Area Great Lakes Sport Fishermen Club. Awards will be presented at the club's banquet held in February. Best of luck this season!